When my Alpine Shop teammates Jeff and David were racing in the IRVOC Jubilee 6hr Rogaine, they got to chatting (as they usually do, these boys are chatty kathys!) with Bushwhacker's Rachel about a race she was doing in June called Plot, Pedal, & Paddle. We'd never heard of it, but we were immediately excited when we learned it was a 12hr race beginning at 10pm. 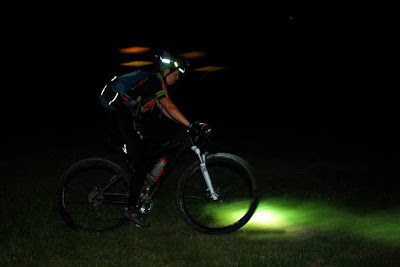 Yes, a night adventure race! Rad! We were super stoked to compete, until we learned that Jeff had family obligations and Doug had to work. Bah, humbug (but HIIII Carrie and Emma and Ellie and Big Shark)! So David and I decided to tackle the race as a 2-person coed team. I was very excited to see how we stacked up against Bushwhacker, and even more excited when I learned that Rev3 and WEDALI were also throwing their hats into the ring. This little, 2nd-year race suddenly had one of the most competitive fields in the country. On the drive up to Dixon, IL, I remarked to David (in between his naps) that it seemed like a bunch of musicians were getting together at a little dive bar for a good ol' jam session. We love competing against each other, but we also love just hanging out with these awesome adventure racing people. And sure enough, right when we pulled in to Race HQ at Camp Reynoldswood, we saw Biz, Andrei, and Amy of WEDALI strolling through the parking lot. Let the chatting begin! I raced with Biz and Andrei a few times last year and these guys are just awesome. It was great to see them and re-meet Amy, a new addition to the team whom I'd only briefly met at the GearJunkie Christmas party. We're gabbing away and up drives the Bushwhacker car, stuffed to the gills with Rachel, Fredrik, Scott, and gear! Let's jam! We do a little pre-dinner gear prep, and then go up to the dining hall for some pasta and salad. David and I both (independently!) miss the memo about the cafeteria line and get our food before everyone else. Oh jeez. At least we make our mistakes as a team! After dinner, we're instructed to turn in our bike helmets to the race staff for undisclosed purposes, and then the pre-race meeting starts. It's great to hear Matt & Dawn's story (they are the Race Directors) and it's clear they've put a lot of work into the course, including last-minute negotiations with MyTopo to get our race maps here on time! Me and David prepping race maps. Photo by John Morris. The pre-race meeting just goes over information that we've previously received in emails, and then maps are handed out. Some of the points are pre-plotted, but we have several to mark so we get to work doing that. 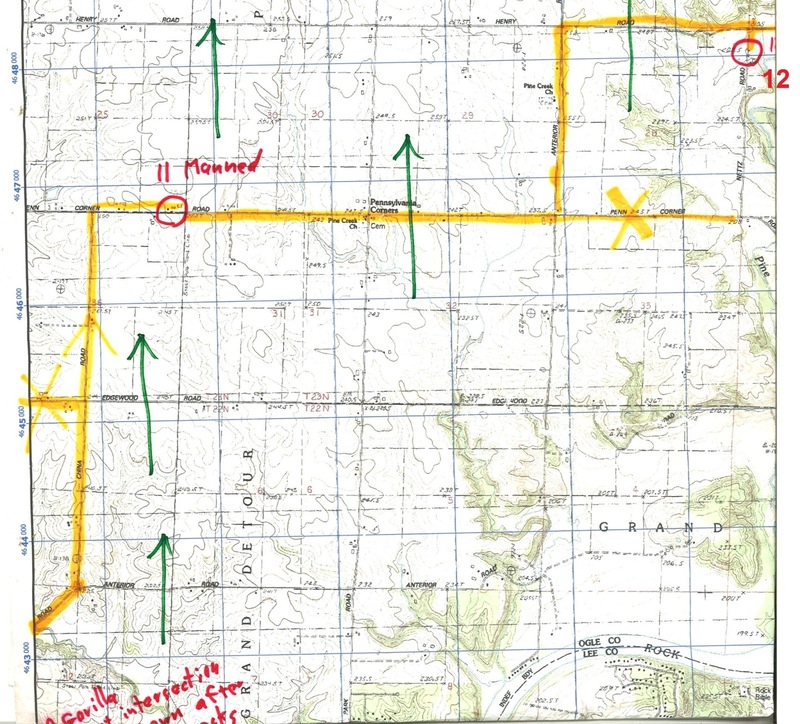 Time flies by as we route-plan, which is a little difficult because there is lots of unmapped information that is being distributed verbally by the RD. David and I are plotting in a room off to the side so we make lots of trips back and forth to the main room to compare notes with Bushwhacker and ask questions of the RD. It's a little crazy and stressful, but as the sun sets we've got a decent plan and we head down to our bikes to get ready. I'm always amazed at how time just disappears before an AR so I'm scrambling a little bit to get my bike ready. Dawn lining us slow runners up for the start. I'm at the far left. Photo by John Morris. GO! I sprint off towards the blinky light and almost immediately I'm in front of the field. For some reason I'm feeling aggressive and I want to take this out HARD. I start following the doubletrack and make the first of several left turns. I'm feeling like this run is taking longer than a prologue should, but a quick glance behind me shows several headlamps following so at least if I'm making a huge nav mistake, the rest of the field is making it too. All of a sudden there is a wooden footbridge on my left. I'm not sure which part of the instructions to follow "keep making left turns" or "stay on the doubletrack". Agony! And the field has caught me! We discuss it for a hot second and I decide to follow the double track. A few hundred meters later I see the helmets draped like Christmas ornaments on a downed tree. Relief! I scan the cluster of helmets once...nothing...twice...THERE they are, at the top of the cluster, too high for me to reach! I loudly ask for a tall person to help me and someone comes to my rescue. Thanks, anonymous tall person! I put one helmet under each arm and run double-football-style back to Race HQ. I'm wondering if there is a shortcut but the race instructions echo in my head "go back the same way you came" so I just re-trace my steps. When HQ is in sight, I'm unsure if I have to go all the way around the parking lot like we started or if I can just dart across the field to my waiting teammate. I'm contemplating this when all of a sudden I'm in a circle of cabins instead of on the doubletrack. Panic! I make a split-second decision to just cut across the field to David. I run breathless into the crowd and no one seems to care that I came in from a slightly different direction than we started. David instructs me to put my helmet in his pack and we run off on TREK 1. Trek 1. CPs 1-4 in order. We're among the first teams to get back from the prologue so the woods are almost empty. We dive into the brush alongside Bushwhacker and start hunting for CP1. The thick vegetation makes nav really tricky and we end up popping out of the woods without locating the CP. Crap! But we see other teams that have overshot the CP as well so we reattack after relocating off of the houses.We find an unmapped jeep road and as it curves around, we spot the flag. I quickly and quietly punch, and we boogie to CP2. We arrive in the circle well before any other teams, but we again have trouble finding the CP in the thick vegetation. We thrash for a few minutes, but no luck. More panic! I even pull out the clue sheet to check our plot, it's correct, so we keep bashing through the briars trying to find this rootstock. More headlamps are arriving and our spirits sink. I start watching other teams and I see WEDALI quietly leaving the area. Rev3 follows them. It's not hard to tell they've found the CP, so I retrace their steps and sure enough, there's the flag hiding in the woods. Mis-hang? Who knows. We've got some teams to catch. David and I hit the gas to CP3 since we've got a nice road to follow. We pass Rev3 and a 2p male team. We cross paths with WEDALI as we leave the road to bushwhack along the river. Here, we get our first of many introductions to stinging nettle we'll experience throughout the race. There are also tons of bugs and I accidentally eat a few. We arrive at CP3 in the lead, but the punch is missing so it takes a few seconds to locate it (on the ground). Thankfully we find it quickly and hustle back through the nettles and up the hill to Race HQ, same as CP4, same as TA. As we're transitioning to the bikes, WEDALI arrives so we start BIKE 1 together. Starting Bike 1. Photo by John Morris. We leave Camp Reynoldswood and enter the town of Dixon in a mixed-up pack with WEDALI. 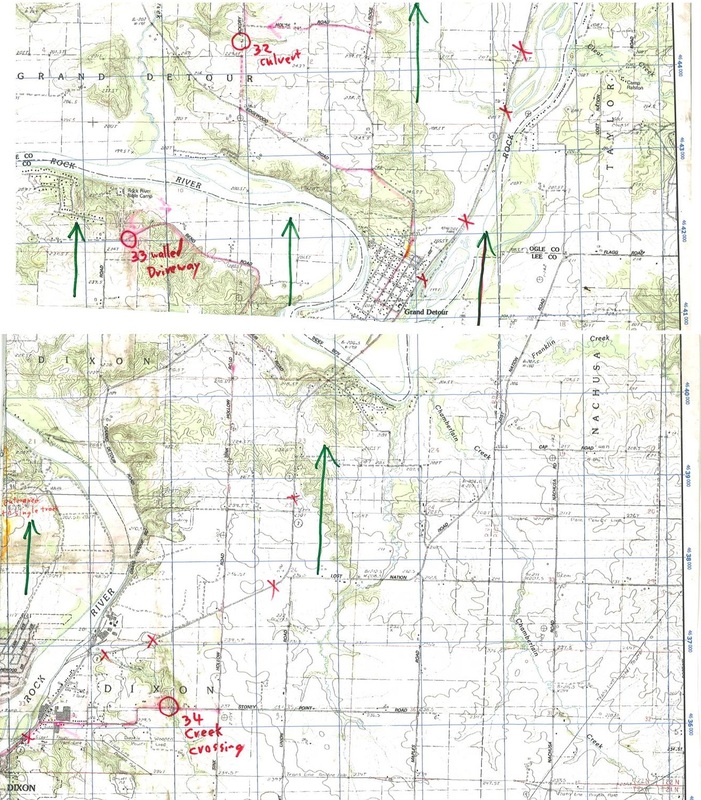 While we were plotting a few hours earlier, we received verbal directions from the RD to go "out of camp, past the Shell Station, and then make a right turn". There was also something mentioned about tennis courts but none of us can remember what it was. So we go out of camp, past the Shell station, and turn right. Which leads to....a dead end. WTF?! Discouraged, all five of us turn around and go back to the Shell station. We make the next right turn, and that leads us to a park. Biz and David find the unmapped trailhead we need for CP5, and we follow it to the top of the hill where the CP is plotted. Everyone drops their bikes and starts searching for the flag. We finally find it, Andrei and I punch, and we all get out of there! Now we have some more weird verbal instructions to follow to get on an unmapped bike path (part of a rails-to-trails bike path). We miss the intended entrance to the trail and end up riding through a neighborhood trying to figure out a detour route. We finally do and arrive at the former Illinois Central Gulf line. As we're riding on the bike path, we have some confusion about where exactly the singletrack is (again, because it is unmapped). The RD told David and I to enter the singletrack before CP6, but WEDALI never heard that instruction. So we have some conversation about what to do, but it turns out that the RD is personally waiting on the bike path to direct us onto the singletrack before CP6. Started biking at CP4 (Start/Finish). Then rode 5-9. In both the pre-race email and meeting, this singletrack was advertised as "gnarly" and "hairy". Those adjectives made me picture some of the lesser-maintained sections of the OT that we rode in last year's Berryman 24hr. So when we get onto the singletrack with WEDALI leading, we're content to sit on their wheels and watch the trail. Except...the trail is NOT gnarly. It is NOT hairy. It's a perfectly friendly, hard-pack dirt trail with a few roots thrown in here and there. This trail is faster than the Dirt Crits David and I have been racing every Thursday night. Okay, it is slick from the recent rain, but that just makes it more fun for us, and pretty soon we're itching to pass. We punch CPs 6 and 7 together and then shoot out in front. Wheeee! Singletrack at night following David's wheel!!! So fun!!! ...until the trail shoots us out onto the bike path and we get confused. The pre-race instructions said "follow the singletrack for CPs 7 and 8" but this section of the trail crosses the bike path and then turns left, doubling back in the opposite direction as CP9. Do we take the instructions literally and stay on the trail, potentially travelling in the completely wrong way? Or do we ignore the instructions and take the bike path to the right, hoping that there is more singletrack up there? With the absence of mapped information, we are clueless. WEDALI catches us and we both decide that we need to take the instructions literally, which means following the singletrack across the bike path and turning left. We ride this way for a ways, and the trail doesn't turn back, and there is a sinking feeling growing in my stomach. David speaks up that he thinks he remembers the RD saying something about "it's okay to turn right on the bike path for a short ways" and after a few more minutes of wrong-direction travel, we decide to bail. The paved bike path is right next to us so we hop onto it, pointing our front wheels northbound once again, and take off. We return to the formerly-confusing intersection, blow right past it, and then less than 100 meters later find another singletrack entrance that takes us in the correct direction. And, a few hundred meters later on that trail, we find CP8, indicating we're back on the correct route. Hooray! We shred the remaining trail and pop out onto a road. 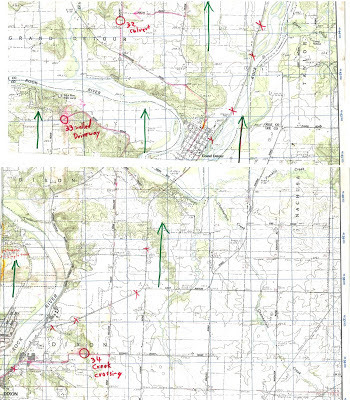 How did WEDALI take a different route and catch us between CP11 and CP12? While we were correcting our singletrack mistake, we passed 1 team in the woods who we believe to be Bushwhacker. That puts us on the roads in what we think is 1st place, since we can't see anyone ahead of us. The night is awesome and there are some storm clouds north east of us that are flashing with lightning, but thankfully the winds are carrying them away from our intended route. I hop on David's tow and we ride hard to CPs 9 and 10 (which is hung on a gorilla sculpture! so fun!). A few kilometers after the gorilla, we spot the lights of a team behind us. We have no idea who it is but they're getting close, so we start hustling even more. 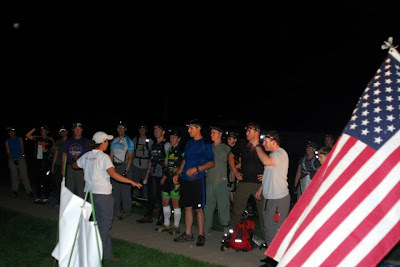 We cruise through the manned CP11 where the awesome volunteers offer us s'mores but we have no time! A few more kilometers after CP11, we spot a team crossing an intersection ahead of us on a different route choice. I have no idea how they got up there since we didn't even consider an alternate route, but anyway now we're in second and we have to GO. We catch up at CP12 and it turns out to be none other than WEDALI. Their newest team member Amy is an absolute bike stud and they are crushing these country roads! 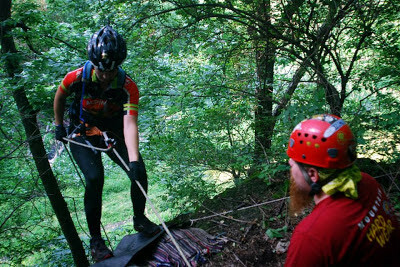 See the gnarly downhill after CP13? That's where I almost met my demise. 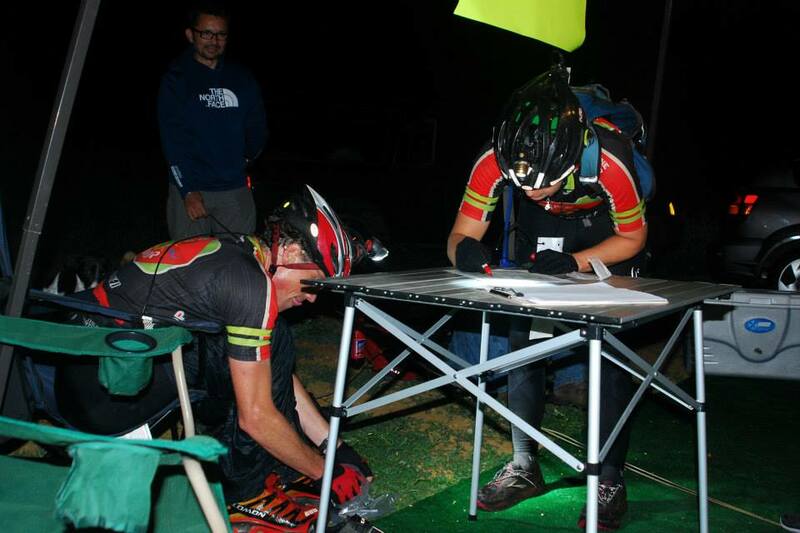 We ride together to CP13 and then it's a horse race to the paddle put-in at CP14. This leg has a huge downhill and David and I just let it rip. We love descending! However, about halfway down, the gravel starts developing serious ruts along our direction of travel. There's no time to react and all of a sudden I'm completely out of control going 30 mph, but unable to brake since that will surely cause me to catch a rut and crash. I fly past David, barely keeping the bike on the road, and just hope for the best. It seems like minutes, but after a few seconds the road levels out again and it's safe to slow down a little. I exhale deeply. That could have been disastrous, not just for our race, but for my overall health. But our crazy risk has turned into a small gap so we run with that advantage all the way to the paddle put-in. I have no idea where our official race map is so here is a google maps approximation. The volunteers at CP14 confirm that we are in 1st place and as we're digging our paddle gear out of the race trailer, WEDALI arrives and we race to get in the water first. David and I make quick work of a 20oz. 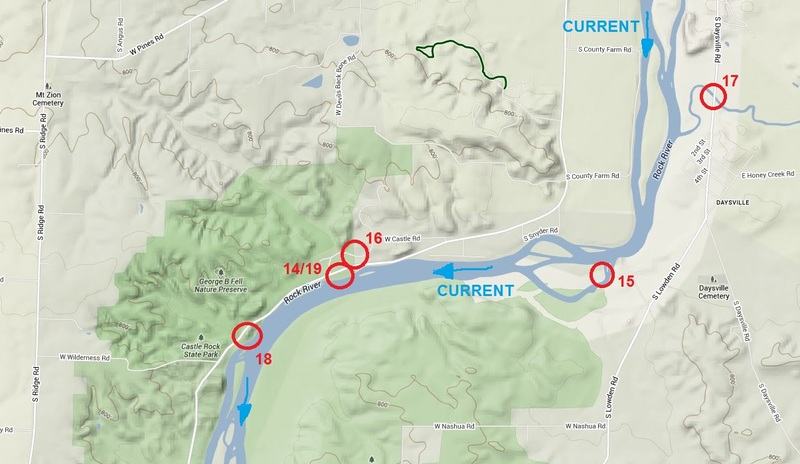 bottle of Coke, throw our PFDs on, attach glowsticks to all of the required locations (2 on the boat, 1 on each person) and shove off into the swift waters of the Rock River. On the previous biking leg, David asked me how I felt about nav-ing the paddle leg. It's a strategic move since it's less disruptive for the front person to stop paddling (to check the map) than it is for the back person. We've actually tried this strategy before at the Bonk Hard Chill, but that was in daytime. However, I've been feeling confident in my nav recently, and I know we need every advantage possible to pull out a win tonight. So I agreed and now I have the map in my hands. 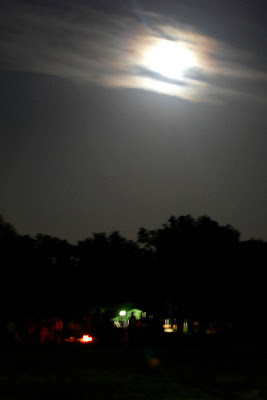 It takes a few minutes to figure out the best lighting strategy - the supermoon is bright but it's intermittently hidden behind clouds. But when I switch on my Stella 300, hoards of bugs attack me, and it's difficult to see the far-off treelines. So David suggests I use an extra glowstick to read the basic features of the map, and then as we get closer to the CP I use the Stella to read the fine details. And getting closer to the first CP is a huge challenge. We're paddling upstream against a very strong current. Fortunately, we've been practicing our upstream paddling in preparation for the Hardwater 50k, but it's still a monumental task just to make 100m of progress. 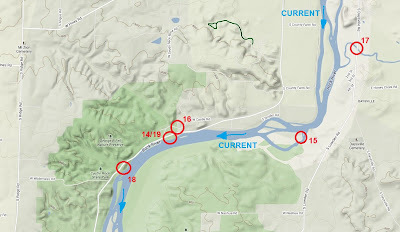 We just keep putting one paddle blade in front of the other and as we get closer to the mid-river islands I narrate our route so we pick the correct channel. We finally make it to the east end of our island, and David drops me off to go get CP15. However, in my excitement of nav-ing, I've attacked the island too early (on the northeast shore instead of the mid-east shore) so I have to do a lot of extra thrashing to find the flag. Meanwhile, David scans the shoreline. After what seems like hours, my headlamp finally pings the reflective tape on the flag and I wade through waist-high stinging nettle for the punch. As I emerge back out to the shoreline, I see WEDALI approaching. David picks me up and I try to make loud conversation that I didn't find the flag, but I'm sure we're not fooling anyone since we leave the area as quickly as possible. The supermoon over Race HQ. Photo by John Morris. The route to CP17 is even more arduous than before. It's continually upstream and when we hit the creek, the current seems to double. Plus, we're now dealing with a multitude of downed trees, limiting our access to the quieter waters near the shoreline. It is a struggle to make progress and more than once we consider dumping the canoe and running to the CP. But we're pretty certain that would mean trespassing on private property, so we stay in the boat and try to keep it upright. David does a phenomenal job maneuvering us up the treacherous creek. One mistake and the current will grab our boat, swing us sideways and flip. We do not want that. We finally see a bridge up ahead and the flag is hanging quietly on its side. We punch and then prepare for the joyride that will be the return trip on this crazy fast creek. We pass WEDALI going the opposite way and cheer them on. Later, Andrei would tell me that he thought we were a jetski because our lights were so bright (bugs be damned, we had to use lights to avoid all of the brush) and we were moving so fast. Ha! Once we hit the main channel, it's smooth paddling to CP16. The supermoon is out in full force so we can turn our lights back off. That's good news too, because whenever they're on it looks like we're in a blizzard with all of the bugs. Despite my best efforts, I eat several. Not yum. I also cram down about 800 calories of snacks since I started to get really bonky on the upstream paddle. We pass Bushwhacker and Rev3 here and warn them of the gnarly creek. CP16 is smooth. Then I have trouble adjusting the nav for our fast down-river pace and almost miss CP18. But thankfully the catching feature island emerges from the darkness at the last second and we punch cleanly. Then it's back up to CP19, the same as the put-in, to finish this thing off. We're pretty cold in transition, but somehow we've managed to build a 15-20min lead on WEDALI on the paddle, despite my screw-up at CP15. We're thrilled to get back on the bikes and start warming up. This is a super-short leg that we complete in a hurry. We go back up the treacherous gravel downhill from before and I'm amazed at the size of the ruts. Another wave of relief floods through me since I was extremely lucky to get out of those unharmed. 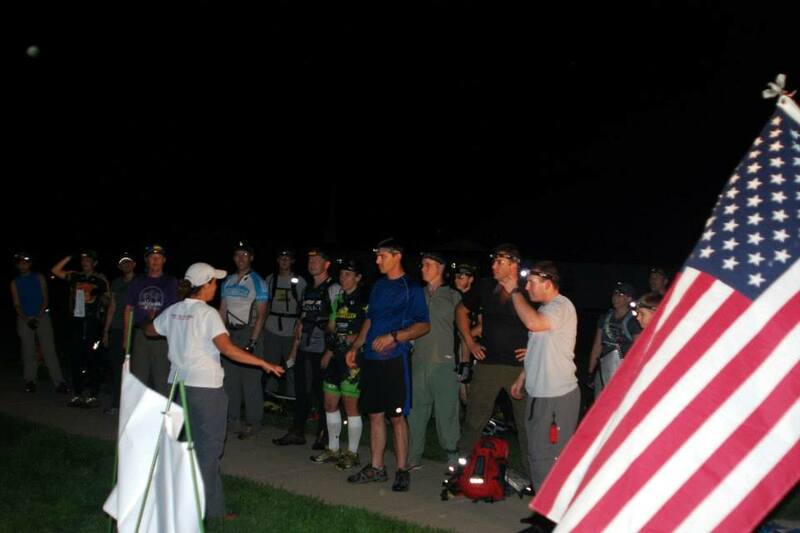 As we roll into CP20, it's time for a gut-check. We're in the lead. One trek and one bike to go, then a shorty rappel at the finish. We have a lead, but when it's WEDALI in 2nd place and Bushwhacker in 3rd, that basically means nothing. So we have to crush this trek to have a chance at winning. We transition super fast and run off through the field on the start of the O-course. David putting shoes on, I'm marking up the map for Trek 2. Photo by John Morris. The first two CPs are typical of what's to come...some field running and some heinous 'shwhacking. At night, it's super hard to read vegetation so we are forced to take slow, but direct routes through the thick briars. And when the briars thin out, that means we're in a creek bottom so there's stinging nettle! Brilliant! But having the lead inspires us and we press onward. 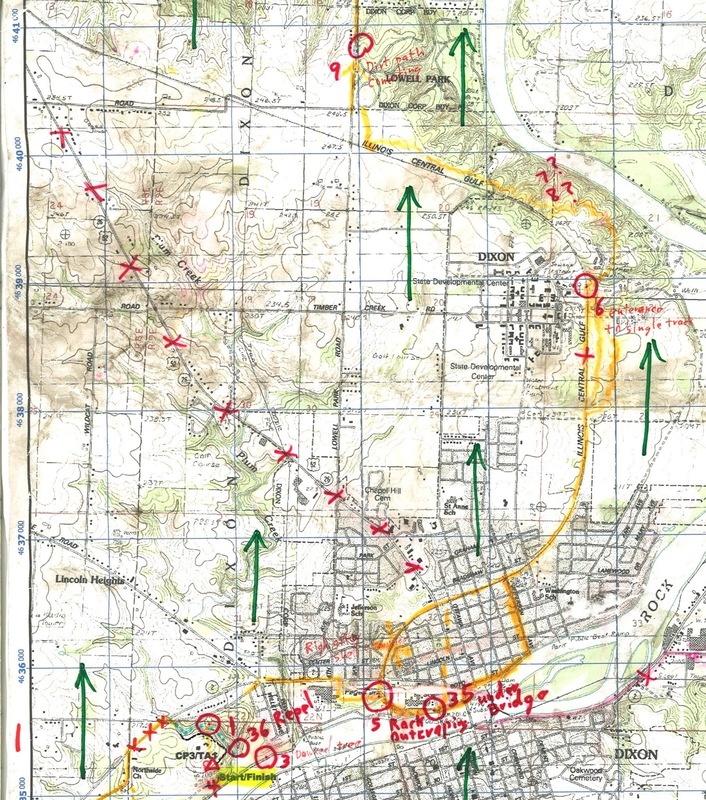 CP23 is especially difficult because we have a long attack on a bearing through these thick woods - David fears we've strayed too far but when we pop into the field, the control flag is almost directly in front of us. Yes. This is where the talented Mr. Frei shines his brightest (although he's pretty shiny most of the time). And speaking of shiny things, the sun has begun to rise so we're able to turn off our headlamps! On the way to CP25, we discover a network of mowed trails in the lower field sections, and happily they head towards our intended direction. We use them as an out-n-back on CP25 and as were running back, I think I spot WEDALI in the distance. My heart skips. We keep running, and I realize it was only a dark branch hanging low over the field. But the apparition keeps us moving forward and we crash through the woods to CP26. 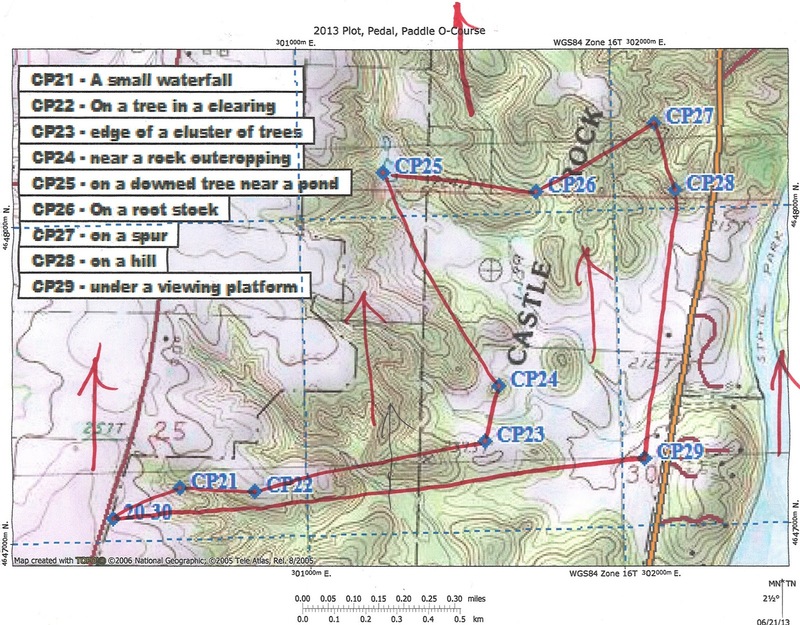 The "South Trails" were not on our race map, but they were really useful! 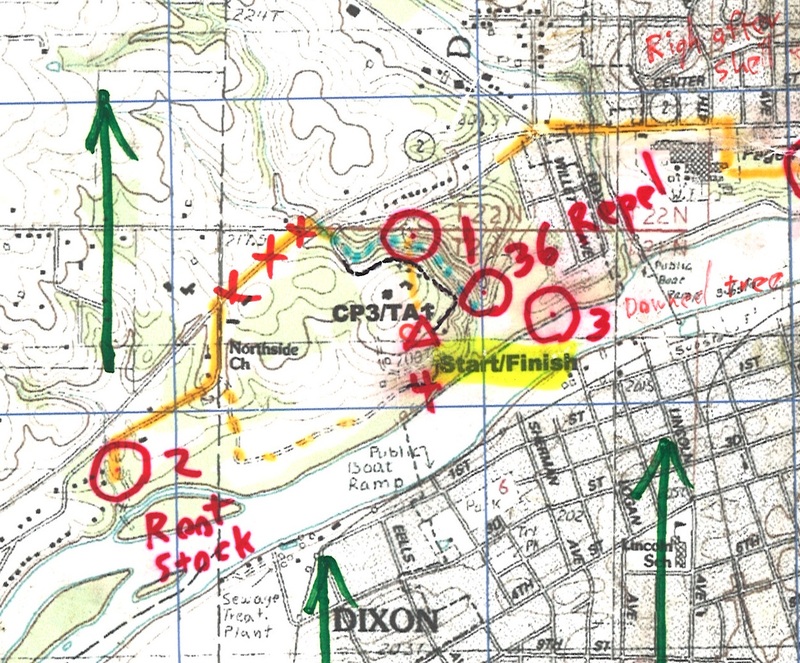 There is an unmapped trail leading in the direction of CP27 so we take that to the top of the ridgeline, follow the ridgeline around a bowl of reentrants, and then descend down the spur for the punch. Except...we keep descending, and descending, and descending, all the way down to the end of the spur and no flag. We climb back up, thinking that we missed it somehow, and we reach the top still without spotting the flag. This is BAD. WEDALI will certainly be here any minute, and probably Bushwhacker too, and now we've got to relocate and reattack. We climb another ridgeline and use the road below to find ourselves on the map, and then attack it again, nothing. To make matters worse, the label for CP27 is obscuring a potentially useful part of the map so we can only re-attack definitively from one direction. We hold a quick team conference, and as we're thinking, we hear voices above us. Yep, it's WEDALI. They can't find CP27 either and we both drop the competitive vibe for a few minutes to decide what to do. David and Biz put their heads together and agree where we are on the map. As they're chatting, I see the three jerseys of Bushwhacker march quietly by, looking strong and confident. So. Here we are, the three top teams virtually tied for the lead with only a couple hours left in this race. It's gonna be a close finish for sure. 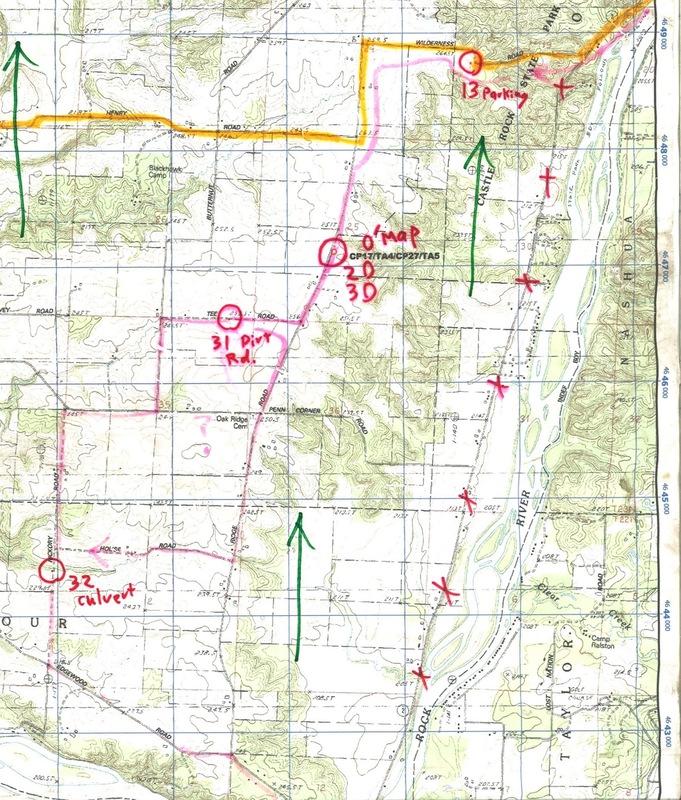 Biz decides to attack the neighboring spur, and without any better ideas, we follow. As we're descending about 20m behind them, WEDALI finds the flag and tells us too. If we'd seen Bushwhacker in the area, we'd have yelled to them, but they are nowhere to be found. We're relieved to have the punch, but now we've got to regain the gap we had before and there's not much race left to do that in. Our two teams take off to CP28 and CP29, and on the way back to the TA (same as CP30) WEDALI gains a few minutes on us. Back at the TA, we tell the volunteers that we think CP27 is mis-hung, but there really isn't anything they can do about it at the moment. 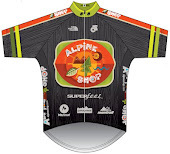 We're resigned to transitioning onto bikes and starting the chase to the finish line. This biking leg starts at CP30. We took the eastern route to CP32, WEDALI went west. 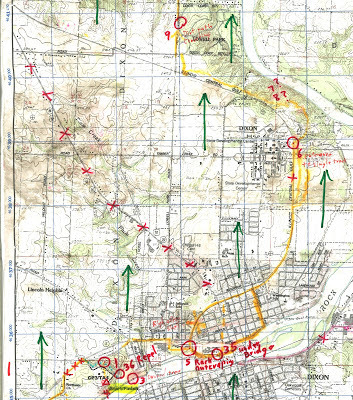 Based on all the ground WEDALI gained on the first biking leg, we know they'll be ready to crush the return trip to Race HQ. There are a few CPs here that offer plausible route choices, so we decide to take whichever one WEDALI doesn't in an attempt to find an advantage. We get our first opportunity after punching CP31; WEDALI continues west and we do a quick out-n-back and then continue south. 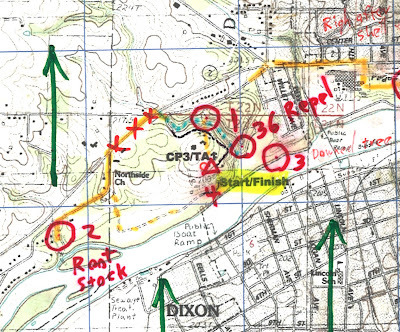 When we have CP32 in our sights, we see them just cresting the hill ahead of us so that route choice was likely a wash. We continue pushing hard through Grand Detour (ahem...John Deere historical site...ERL) and up to CP33. 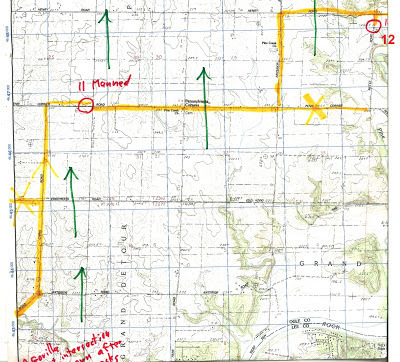 After CP32, we went through Grand Detour and then took CP33 as an out-n-back. WEDALI continued west and hit CP34 as an out-n-back. Still no sign of WEDALI so we take CP33 as another out-n-back, expecting to see Bushwhacker catching up to us at any point. However, we find ourselves alone on the windy (that's blowy-windy, not twisty-windy) road, trying to share the draft as much as possible. We punch CP34 and CP35 without difficulty and then ride our way back to Race HQ, making the most of our mountain biking skillz by hopping several curbs. We are pretty sure we're in 2nd at this point, and that fact is confirmed by the RDs as we roll back into transition. We take the time to change shoes before grabbing our climbing gear and running off to the rappel. Me starting the rap. G. Scott supervising. Photo by John Morris. As we're approaching the rappel location, we hear voices. With Minnesotan and Russian accents. I'm frankly surprised to learn that WEDALI is still here. This means the gap was smaller than we thought. David and I worked hard on the last biking leg, but we certainly didn't exhaust ourselves. Maybe we should have ridden just a hair harder...anyway there's no time for speculation because the race is essentially over at this point. We meet Amy at the top of the rappel and she is nervous. She's never rappelled before, so between her teammates at the base of the cliff and us at the top, we talk her through it and she rocks it. Good job, Amy! David and I get checked out by my favorite AR ropes dude G. SCOTT and then I clip in. Just as I'm easing myself over the cliff's edge, a mosquito bites me and I reflexively swat at it, lose my footing, and smash my hand into the rock. No broken fingers though, and we finish up without incident. We jog back to Race HQ (complete with one final sprint through a patch of stinging nettle) and the RDs along with WEDALI are there to greet us. We cleared the course in 10 hours and 25 minutes for 2nd place overall and 1st place 2-person coed! The finish of this race is bittersweet. David and I are certainly proud of our result, of being able to compete with WEDALI and Bushwhacker all day, and of working together as a true team. But we are also disappointed to have had a solid lead going into the later stages of the race and then watched it slip away because of a potentially mis-hung CP (I say potentially because we didn't go back out there with the RD to verify...but when two of the top AR navigators agree it's in the wrong spot, there's a pretty good chance it is). 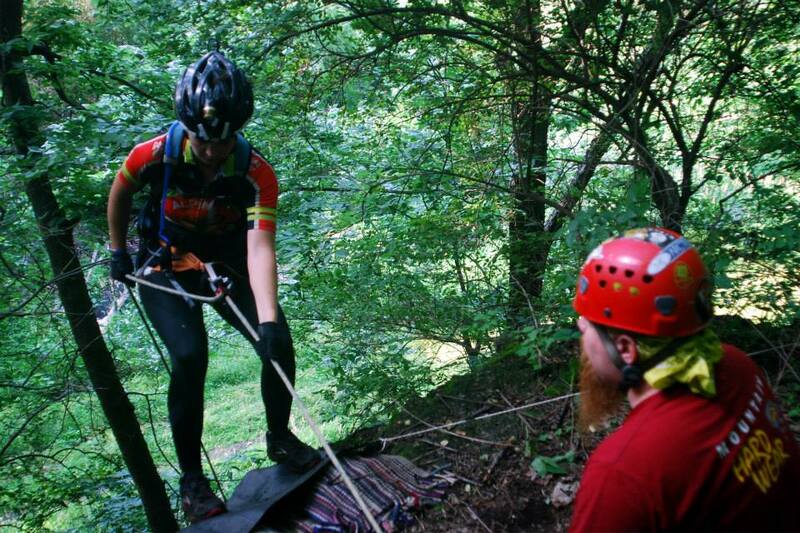 But that's adventure racing, and every single team had to deal with that same situation. It's always an honor to race against our friends on WEDALI, Bushwhacker, and Rev3. Our teams continually beat each other up at these Midwestern races and it only makes us all better. 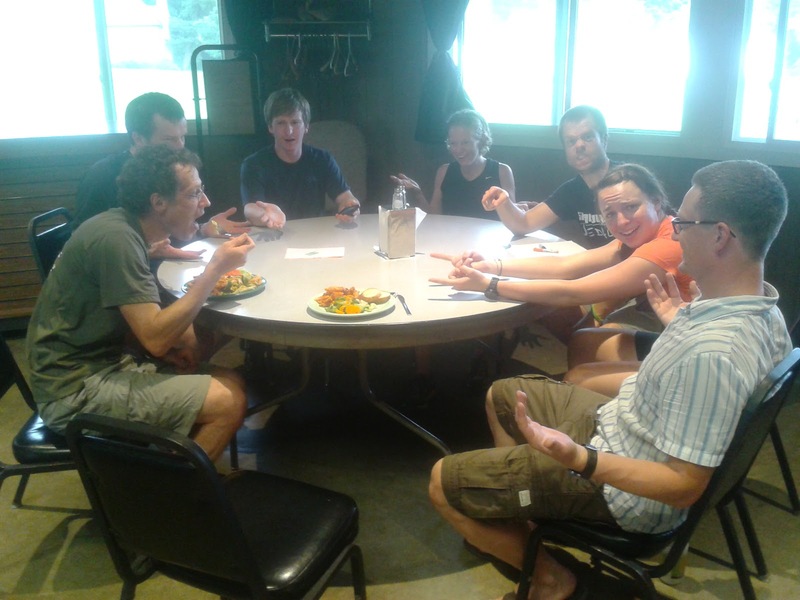 The post-race camaraderie is pretty great; we all share stories while cleaning up gear and eating post-race pizza. There are even showers on site so we don't have to climb into cars with stinging nettle oils all over us, or still smelling like mud! Plot, Pedal, & Paddle is a pretty small race, but I hope everyone realizes what a cool format it is. First of all, with a 12hr night race on Saturday night, there is no need for pre-race hotel costs. You are racing instead of sleeping! Secondly, you can drive to/from the race on Saturday and Sunday, eliminating any need for time off work on Friday (if you have weekends off by default). Finally, night racing is a really important skill for adventure racers in the 24+ hr races, and this event gives teams a chance to practice that skill without the exposure/risk that a 24hr race carries. I've exchanged a few emails with the RDs and they already have a whole bunch of improvements ready for 2014. So I hope to see you there! Yeah that singletrack was a bugger. Fun though and I'm glad the RDs made the effort to include it in the race. Always fun to race against you guys and so happy you're back in the States!! Hey Dave! I don't think CP1 was off by that much. When we reattacked from the road, we went straight to it. So maybe a little but not a lot. Great seeing you out there and good job surviving an eventful paddle!